In June of 2008, Blue Water Ventures- contractors for Mel Fisher’s Treasures- discovered an exquisite and exceedingly rare high karat gold drinking vessel on the widely scattered Santa Margarita shipwreck site. An ornately engraved bowl arises from a threaded base into eight lobes, with two beaded “question mark” handles. The artifact- called a bernegal by the Spanish- features a coat of arms engraved into the interior center, and while some promising clues to the arms’ identity have surfaced, its definitive provenience remains a mystery. There is no chronicle of all the arms that have ever existed. 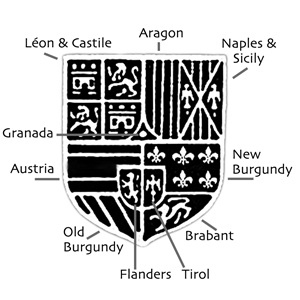 As Heraldry expert Willem Vandenberg (of blazonsearch.com) pointed out, even Rietstap’s Armorial Général does not contain all of the arms that ever existed in Europe. Arms can represent families, but can also represent cities, towns and guilds. The chalice arms are family arms because of the presence of a helm- or helmet- at the top center. 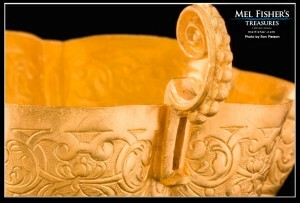 The helm above the shield is used to indicate the rank of the bearer. The style of helm above the chalice arms may indicate a “peer” i.e. Duke, Marques, Earl, Viscount or Baron. Arms features may change over time via marriages/unions, etc. 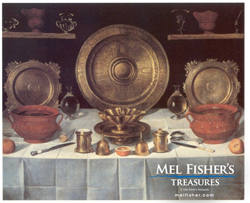 The top two quadrants of the chalice depict lions and castles such as those found on the Hapsburg shield, but positioned oppositely than those of the Spanish empire’s ruling family – though as the 16th century illustration below exhibits, such reversals may not have been an entirely uncommon rendering. 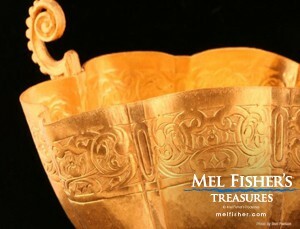 The chalice itself may have originated in the Old World. 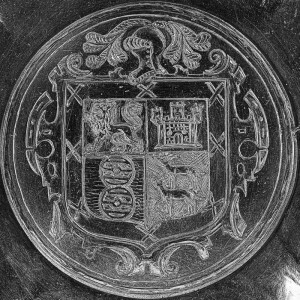 However, the engraving of the arms looks “naïve” in comparison to the bernegal and may suggest that they were added at a later time, in the New World, by a New World artisan unfamiliar with heraldry. Claudia Costanzo, a cultural resource specialist/artist from Madrid, said her impression was that the bernegal was perhaps European made, the arms added at a later time in the Americas. An indigenous New World artisan, unfamiliar with heraldry, might easily take artistic liberties with the design. The animals in the 4th field of the bernegal may be harts/ stags or even possibly wolves. 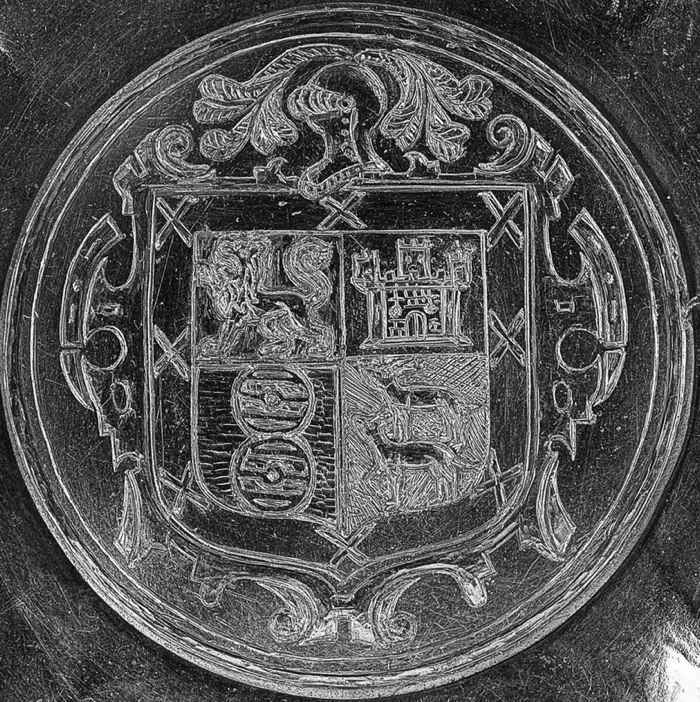 Wheels are not common on coats of arms. The few examples of arms with wheels that researcher Brooks Barnes has been able to locate are spoked wheels. The wheels in the 3rd field of the bernegal- which Barnes describes as being “peasant style wooden cart wheels”- do not resemble any we have found in heraldic references to date. It has also been suggested that the wheels may represent cannon carrier wheels. 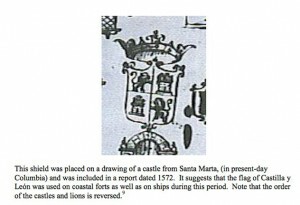 On account of the inclusion of the two animals and the circular objects, one researcher suggested that the shield was associated with the ancient Castro family. 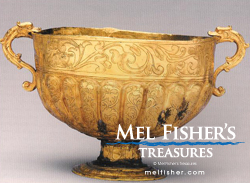 However, the circular objects on the chalice arms are most certainly a type of wheel, and research into the Castro family history revealed that the circular objects on the Castro arms represent coins. Excerpted from House of Carrillo from Wikipedia: The House of Carrillo is a Spanish noble house that traces its origins from the ancient Kingdom of Castile. There are several branches that exist such as Carrillo de Albornoz, Carrillo de Mendoza, Carrillo de Figeroa, Carrillo de Toledo and Carrillo Tablas among others. There are also several variations in spelling of the surname Carrillo such as “Carillo.” Records prove that both surnames are one and the same. The word carillo is used in Spanish to refer to any “small cart.” It has been derived from the word carril, which means a cart, cartway, a narrow road or rail. There is another account of folklore, which is not entirely corroborated by historical evidence, but has basis in historical literature. The account states that at the time of Count Fernán González of Castile, there were two brothers that were so loyal to each other, they never left each other’s side. The brothers were of royal blood, and were always seen traveling together. Eventually, the people began to make reference to them, comparing them to “”two wheels on a cart” (which in most dictionaries of today, has come to define Carrillo- a small cart, or wheels of a cart). The legendary brothers were supposed cousins of Berengar I, King of Italy and descendants of Louis the Pious and Charlemagne. It is said the brothers accidentally killed a favorite courtier of their King which forced them to flee into hiding to avoid the King’s rage…The brothers eventually arrived in Spain after being placed under the protection of Count Fernán González of Castile. The name Cervantes has also been a contender in the investigation, if one assumes the animals in the forth quadrant to be stags. Leonel de Cervantes, a Comendador of the Order of Santiago (and a distant relative of Miguél de Cervantes Saavedra, author of Don Quixote de la Mancha), arrived in Cuba in 1519 and rode with Cortés in the conquest of México. For his service under Cortés, Cervantes was granted several encomiendas (Native American villages). Cervantes settled in New Spain (Mexico) with his wife, six daughters and one son. All of the daughters married nobility. Brooks Barnes wrote: The small cadre of Spanish nobility of (New Spain), what would become Mexico, all knew each other and were all inter-related, if not directly then through marriages of cousins, uncles and the like. 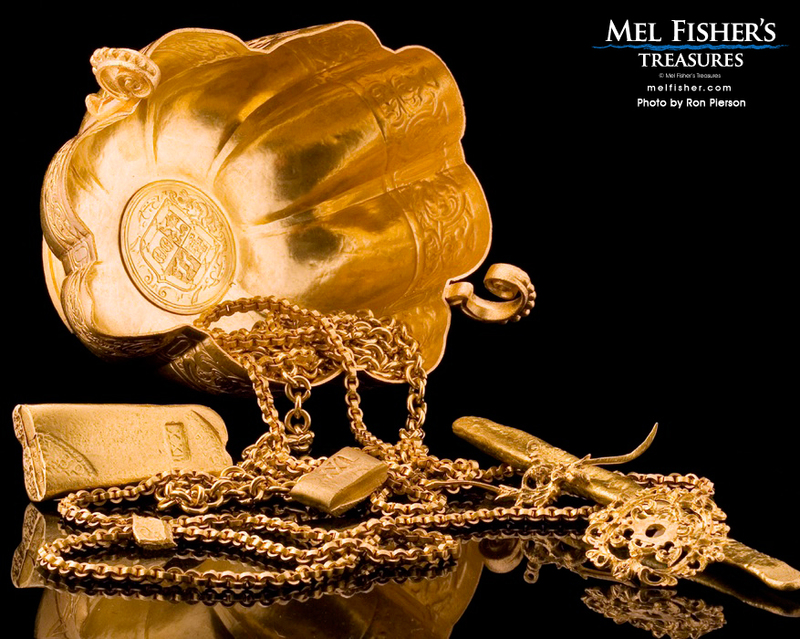 IT was a small society (only 506 men are known to have received encomienda grants from the crown) and many held shares in gold and silver mining operations. 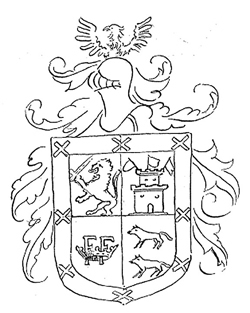 In 2010 Barnes wrote…if Leonel had a coat of arms, he would have had his two stags on the left side, presumably juxtaposed with his wife’s (Leonor de Andrada y Lara). 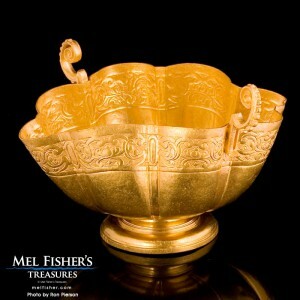 Barnes speculated that the chalice might have belonged to a 4th generation female descendant of Leonel. In 2011 Barnes made a potential break-through when he discovered the arms of the Francisco Miguel de Salamanca family, a nearly 75% match. 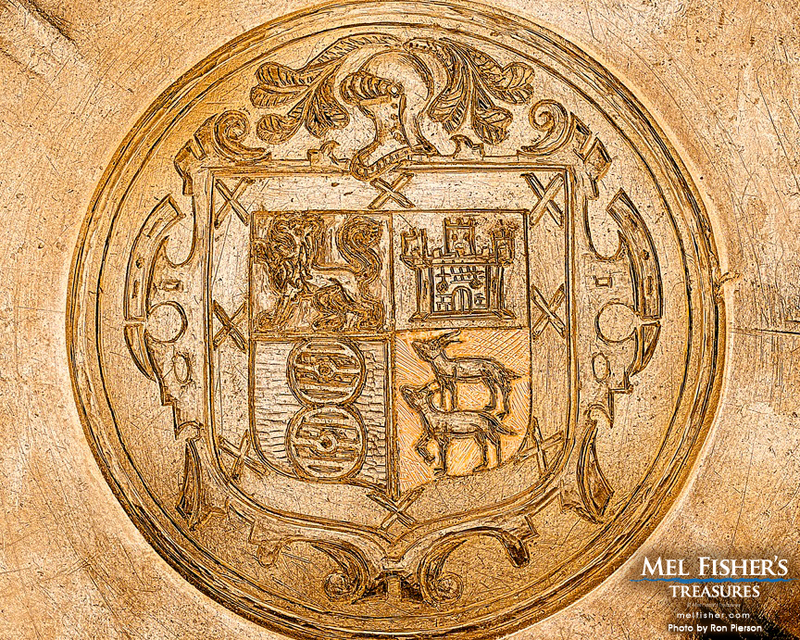 Barnes wrote: The coat of arms came from a book published in 1933 called Ledulario Heralico Conquistadores de Nuevo Espana, which describes Arms granted to the original Conquistadors by the King and Queen of Spain. 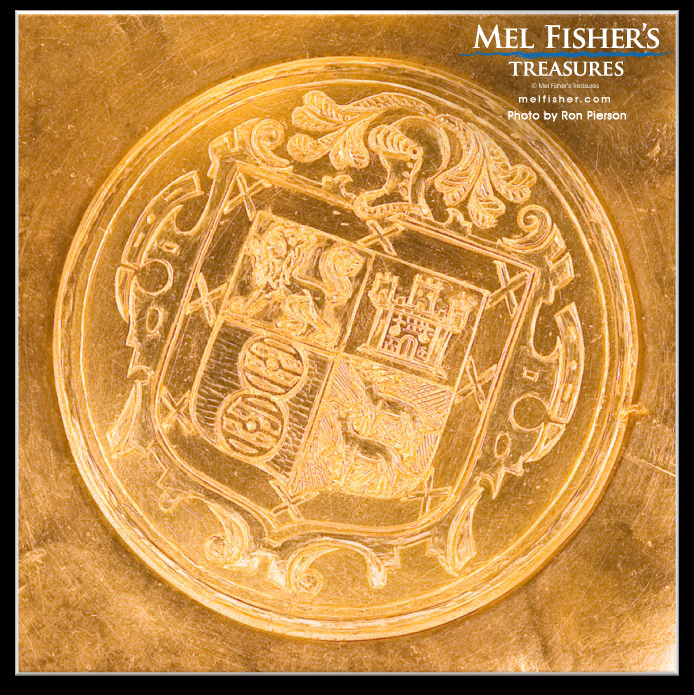 Each shield is hand-drawn, but the book (completely in Spanish) did not note whether the drawings were by a contemporary 1933 artist based solely on the earlier textual descriptions, or were hand-drawn copies of illustrations that exist in the archives in Spain. All coats of arms in the book seem to have been drawn by one artist and absolutely none of the others (over 100 in all) were remotely similar to this one. Spanish Arms unlike other European Arms were achieved through military actions and can be passed down through Maternal ancestors. 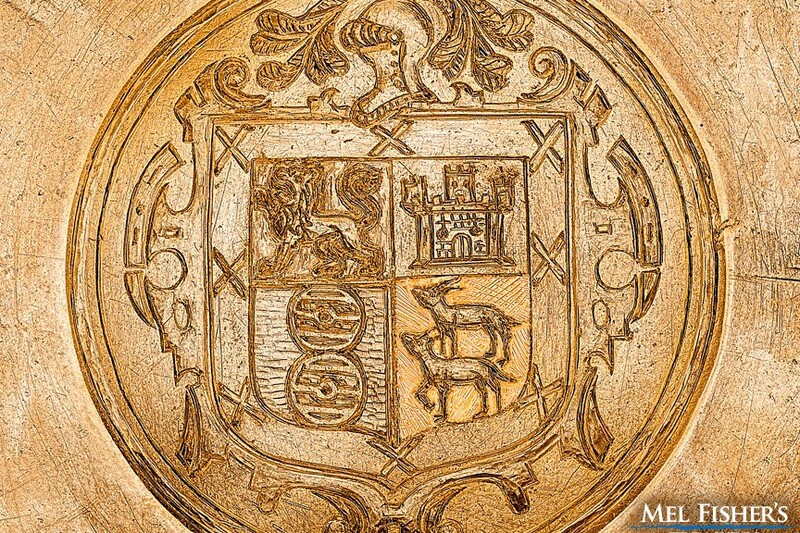 The following 145 men received Coats* of Arms from the King of Spain between 1525 and 1589. Twenty two of these men were Native American Nobles and have the title “Don” preceding their names. All were cited for their personal sacrifice, and valor. These Arms were for their part in the Conquest of Mexico. 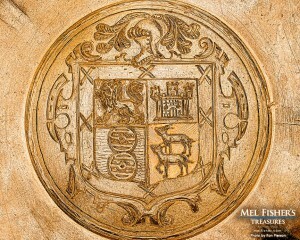 Salamanca, Francisco Miguel de- Arms granted 25th of April, 1532. For 14 years of service under the Captains Juan de Grijalva, Panfilo Navaez and Gonzalo de Sandoval. He was involved in the conquest of many of the provinces of New Spain. *Source of names: Garcia, Carlos M Dedulario Heraldico de Conquestadores de Nueva Espana. The Salamanca arms bear an eagle above the helm. The chalice lion is passant; the Salamanca lion is rampant and wields a sword. The chalice arms have two wheels in the 3rd quadrant; the Salamanca arms display the double letters F within a coronet that might indicate a Duke or Marques. The Salamanca arms display three flags on the castle battlements (per Brooks Barnes, these are described in the official Salamanca grant from the crown- “tres vanderas pardas”). 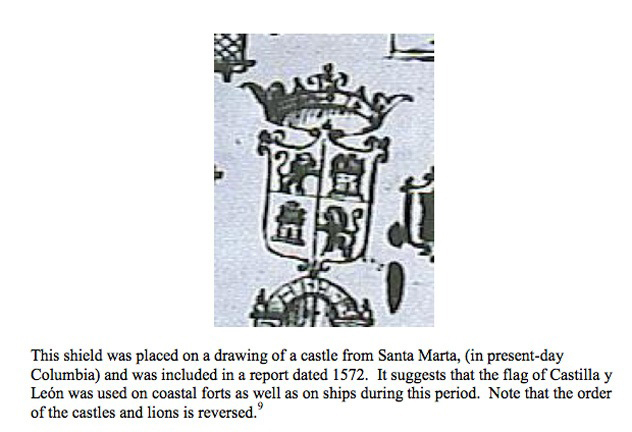 The animals on the chalice look more like stags or harts; the animals on the Salamanca arms are wolves (per BB, “lobos negros” in the official Salamanca grant. Tedesco to Barnes: “Brother” in Latin is Frater. I wonder if the two F’s within a coronet could represent two noble brothers – and wouldn’t it be interesting if the chalice arms’ wheels were a metaphor for the two noble brothers of legend- as alike as two wheels on a cart. Arms that were generated in the New World may not have been recorded in European armorials. Taking into consideration the bernegal engraver’s lack of attention to the conventions of heraldry it would not be altogether surprising if the chalice crest were indeed a representation of one of the “shaky coats of arms” spuriously purchased by one of the nouveau riche of the Americas, who likely would not have known better themselves. 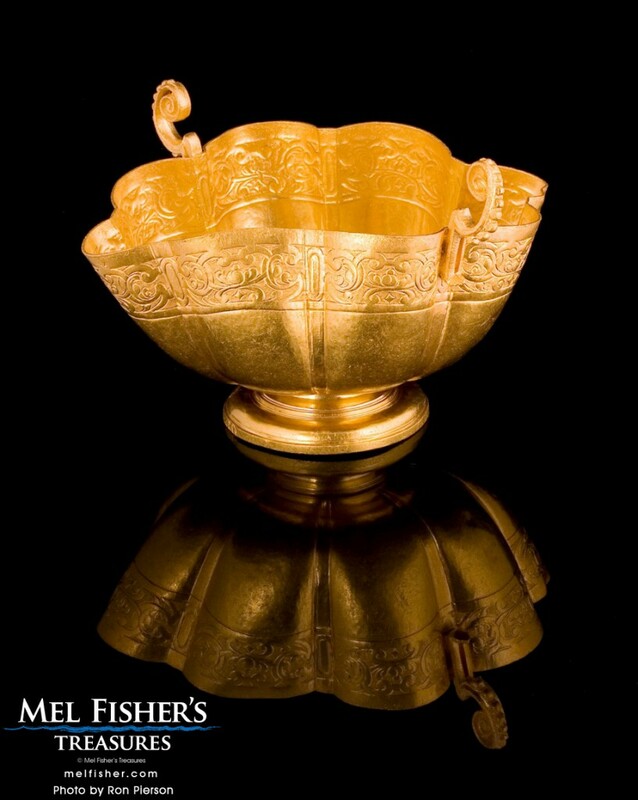 There is yet another complicating factor when attempting to attach a family name to the golden cup and the arms engraved within. 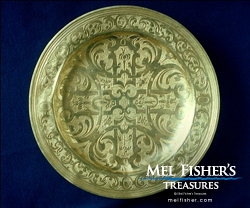 According to historian Dr. Eugene Lyon, although the Santa Margarita was a Tierra Firme fleet ship, whose purpose was to transport Peruvian and South American treasures, while in Havana en route to Spain, Margarita received cargo from New Spain fleet ships. For example, Nuestra Senora de Candelaria from Honduras and Nuestra Senora de la Antigua of New Spain are known to have offloaded into Margarita. 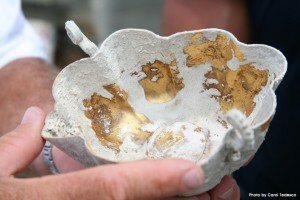 According to historic research expert Jorge Proctor, while the manifest of the ship from which treasure was being transferred would have included a notation about the transferred cargo, the manifest of the receiving vessel would not have been changed or altered. 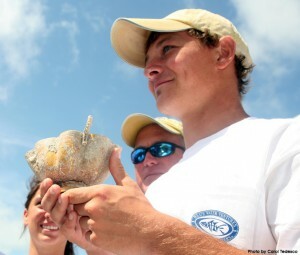 And, while Dr. Lyon discovered the manifest for the Santa Margarita some years ago, no such documents for the off-loading vessels have yet been found. A solution to the identity of the chalice arms may never be revealed, but in a way, its continued mystery strikes a poignant note in its captivating beauty. And who knows, someday a coat of arms in an old painting or a packet of ancient papers may at least provide a new chapter to its centuries old story.